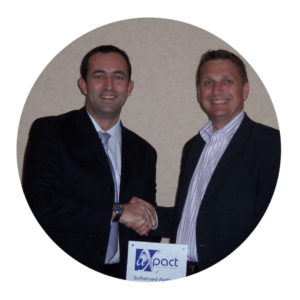 DynamicsPact started out as AXpact in 2004 with our launch at the European Supply Chain and Logistics Summit in Amsterdam. Today we have a reputation as one of the best global delivery partners for Microsoft Dynamics 365. 14 Years of International Success! Our founders Michael Blatherwick (Managing Director of Sense Enterprise Solutions, UK) and Nico Tissink (CEO of Pulse Automation, Netherlands) worked together on an AX project which required international collaboration in their respective countries. It was the success of this business relationship which sparked the idea for AXpact; an alliance of the best AX partners around the globe who would work within a structured framework to help each other do better international AX projects. In 2004, they then invited other like-minded Microsoft Partners from around the world to the AXpact launch event alongside the European Supply Chain Expo in Amsterdam. They presented the AXpact concept to some of the most accomplished AX partners in the world and we are pleased to say that all of them shared Michael and Nico’s vision. Eight out of the eleven attending partners signed up immediately and AXpact was born! Today AXpact has over 30 members and is regarded as one of the strongest partners for large enterprise Microsoft Dynamics 365 projects.